SIM2 Mico 50 review | What Hi-Fi? In recent years the home cinema projector market has become an increasingly hostile environment for traditional projector specialists such as SIM2. Mainstream brands such as Epson, JVC, Samsung, Sony and Panasonic have been steadily encroaching on their territory, packing big-brand price competitiveness with increasingly formidable, large-budget engineering. The results are plain to see: while few could contest the notion that you get what you pay for in life, it's equally indisputable that the best mainstream kit, especially the latest models from JVC and Panasonic, now offer all the performance many prospective projector buyers could ever need. But SIM2 isn't about to give up without a fight. By its standards, the Italian projector specialist has been feverishly active in the last year, producing a series of new models each aimed at raising the performance bar ever higher. Even so, the company's new Mico 50 is something extra special. The core of this £15,000 leviathan is distinct from any earlier SIM2. Instead of the established DLP projector system of lamp and rotating colour wheel (or multiple DLP chipsets) used by most SIM2s in the past decade, the Mico 50 employs an all-new LED-based light engine, using technology developed by US company Luminus. This replaces a conventional lamp with three so-called ‘PhlatLight' LEDs – one for each primary colour – arrayed to shine on to a single 0.95in DarkChip4 DLP chipset. This approach has numerous advantages, most obvious of which is that it eliminates the so-called ‘rainbow' effect that can blight DLP viewing for some (but by no means all) viewers. Additionally, as there's no colour wheel in the light path from lamps to lens, images appear brighter and punchier, much as when you compare the same image on single-chip and three-chip DLP projectors. The sheer light efficiency of LEDs helps in this regard too, enabling SIM2 to claim a spectacular full-on, full-off contrast ratio of 100,000:1. The numbers sound impressive – and even more intriguingly, PhlatLights offer more than just performance enhancements: they also last much longer than the bulbs in conventional projectors, consume notably less power, and contain less hazardous materials. In fact, SIM2 claims the Mico 50's LED modules should last around 30,000 hours, which equates to four hours' use a day for 20 years. They also illuminate very quickly, so you waste less time powering up and turning off, and they even generate less heat, so less energy needs to be expended keeping the projector's innards cool, which in turn helps the SIM2 to run more quietly. 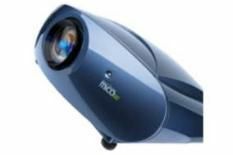 In tandem with a new liquid cooling system, the result is a huge projector (and the Mico 50 is huge, at more than half a metre wide and 25kg all-up) that's also astonishingly quiet. And the performance? According to the press release, Mico means ‘Sparkle' in Latin, but that seems a curiously inadequate way to encapsulate the SIM2's advantages over its rivals. This projector doesn't so much sparkle as shine, its staggering light uniformity, edge-to-edge brightness and sheer vibrancy giving its images the punch of a giant direct-view television. With a clean Blu-ray transfer – District 9's direct-from-digital intensity is ideal – it's a staggering experience, one that leaves even hardened AV reviewers speechless. The Dark Knight's extended night-time sequences, so stern a test for any video display device, are even more remarkable: the Mico 50 simply lifts the veil of murk that blights the image with so many lesser, cheaper designs, snapping the action to the fore in quite spectacular style. Of course, £15,000 spent just on video projection really ought to deliver that sort of impact: we would expect nothing less. But all the same, it's reassuring to learn that in every aspect, from edge definition and fine detail retrieval to the punch and vibrancy of both backgrounds and solid blocks of colour, the SIM2 Mico 50 delivers reference-grade, first-class big-screen magic. Yes, it's both huge and hugely expensive but, naturally, its core technologies will be making their way into cheaper, smaller SIM2 designs in the months to come – which can only be good news for everyone.